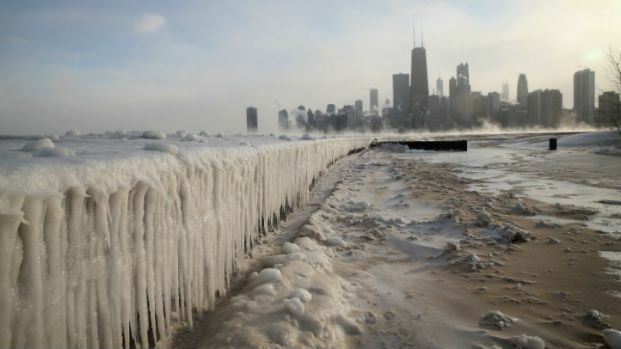 A Winter Storm Warning remained in effect for several counties across the Chicago area until early Monday morning as a weekend storm dumped several inches of snow. Some areas saw more than 7 inches of snow as of Sunday evening with snow continuing to fall into the night. The warning was upgraded from an advisory, taking effect at 3 p.m. Saturday for McHenry, DeKalb, Kane, LaSalle, Kendall and Grundy counties, remaining in effect in those areas until midnight Sunday night. Winnebago, Ogle, Lee and Boone counties were originally under this warning as well, but the National Weather Service said Sunday afternoon that it will be lifted in those areas at 9 p.m.
Cook, DuPage, Lake and Will counties in Illinois, and Porter and Lake counties in Indiana were under the warning beginning at 6 p.m., again through midnight Sunday night, according to the National Weather Service. Kankakee County, as well as Newtown and Jasper counties in northwest Indiana were under a less severe Winter Weather Advisory beginning at 6 p.m. Saturday through midnight Sunday night. Snow began to develop across the area by early Saturday evening and was expected to continue through Sunday night with accumulations of more than 6 inches possible. Areas south of Chicago were expected to see less snow, with accumulations of 3 inches or less forecast. Monday stays cold with highs in the upper-20s and light snow continuing into the morning hours. More light snow is possible during the evening as well, continuing into Tuesday morning.